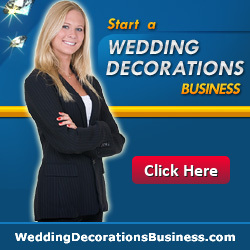 Would you like to sell the 'Wedding Decorations Business' pack and receive 60% of the sale price. You simply need to get a free account with ClickBank.com and you can start selling straightaway. You can use your own website, PPC ads or mention the product in an email newsletter or ezine. We have produced some banners below to make placing adverts even easier. Please feel free to use these in your marketing. Simply right click and save them to your computer.